Contributing editor Luan Gaines spoke recently with author Diane Haeger about her latest novel, The Queen's Mistake , Henry VIII's misunderstood fifth wife, the past she could not change and the future that had been decided for her. Interviewer Luan Gaines: What was your inspiration for The Queen's Mistake ? What is the significance of the title? Diane Haeger: I love the title. It refers to the series of mistakes Catherine Howard did make for the love of two different men, Thomas Culpeper and her husband, Henry VIII, mistakes that ultimately came back to haunt her. Perhaps it should have been called “The Queen’s Mistakes,” but that didn’t have quite the lyrical sound to it. Catherine Howard has not been treated kindly by history, yet you write of a foolish girl rather than a selfish one. What shaped your perception of this character? Wonderful question. My background is in the field of psychology, so I tend to look at the characters about whom I write in a far less black and white manner than some historians do. There was, of course, an element of selfishness to Catherine Howard, there can be no denying that. However, in researching her life, I came to feel that much of her behavior was predicated on a general immaturity, naiveté, and a deep desire to finally be loved, more than on anything largely selfish. My perception of Catherine was shaped by spending a year with her, so to speak, learning everything available about her life, her relationships and her behavior. As I did that, a far more complicated person than the stereotype began to emerge for me. What is Catherine’s situation in the Howard family before joining the court of Anne of Cleves? Is Catherine’s sexual experience encouraged because of specific plans for her future or is such promiscuity commonplace? She is primarily of little use to any of them at that point, the daughter of a middle Howard son, educated only so much as was absolutely essential, and otherwise left mainly to her own devices with a grandmother who showed her very little, if any, affection. I had the feeling from my research that her promiscuity was not so much encouraged as tolerated in a rather dull, rural environment where there was little to distract her. Francis Dereham insists he has a trothplight to Catherine? What is a trothplight and is it binding? Why doesn’t Catherine take Francis Dereham seriously? To be troth-plighted was a step up from our current day engagement. It was considered binding and in some ways like the 1st steps of a marriage. I can only guess why she did not take him more seriously naturally, but it seems she committed to something of which she later grew weary since, for her, those early entanglements were more about promiscuity and looking for love than actually having found it. Families rise and fall at the king’s pleasure, bartering their daughters for advantageous marriages. What does this practice reveal about the attitude toward women in the sixteenth century? Clearly, that they were a commodity rather than people, in many ways. Based on her behavior, I think Catherine knew that and treated herself accordingly. She knew she was beautiful, so she used that. But I do think her sense of self-respect - never really cultivated - stopped there. Catherine Howard is a pawn to the plans of her ambitious family. Who are the major players on each side, from the Duke of Norfolk and Bishop Stephen Gardiner to Thomas Cromwell and Archbishop Cranmer? I think you have the major players right there, but also Catherine was somewhat of a pawn to Henry himself, and his disintegrating ego, as a man who valued her as a trophy initially, and did what it took to win her, the great young prize - his rose without thorns - in order to increase his own fading sense of manhood. I’m not sure he ever really stopped to consider what a young, beautiful girl realistically might want because if he did, surely he would see that his power and money were really all he had to draw her. At what point does Catherine realize she is meant for Henry, not some nobleman? Not until the point of no return, especially toward her love for Culpeper, and the compromises she has made because of that. She knows her family wants her to make an advantageous match, and initially she thinks a personal friend of the king’s would fit the bill perfectly. “Once Henry desired something, he could not be stopped.” What is the significance of this statement as it affects Catherine and her future? Henry was king of England, the most powerful man Catherine could even imagine. He was in control of her world, essentially, and her family’s, so there was no point in objecting. Henry had been king for many years, accustomed to having his way, by the time he met Catherine. He had cast off Rome and begun an entire church of his own to have Anne Boleyn, as an example of that desire and power to have it his way, and Catherine knew that. She also knew what had become of her ill-fated cousin. It is my premise that she feared that same fate almost from the beginning. Catherine continues to charm the king, thinking to win his approval for her marriage to Culpeper. Having had romantic liaisons in the past, how could she fail to notice Henry’s increasing interest? Catherine was obviously adept at flirtation and she liked the powerful feelings it gave her. It is my belief that she attempted to use that power in the beginning, not realizing there might well come a point where she would no longer lack the control of her situation because of it. By the time she did fully realize it, it was sadly too late. Thomas Culpeper views Catherine as a challenge, then a dalliance. When does Thomas realize that he has fallen irrevocably in love with Catherine Howard? I think both characters were victims of their beauty as well as their ability to be flirtatious. By the time Thomas does realize what has happened, for him as well as for Catherine, it is too late because Henry has already decided to claim her. Why does Culpeper persist in his pursuit of Catherine? Is there an element of rivalry between Thomas and the king? I don’t think he does persist, not actively anyway. But in love there is always that element of chemistry, and they are thrown together in the microcosm of court where it is difficult to get away from one another fully, thus the temptation is always looming, so there was definitely contact. What role does Lady Rochford play in Catherine Howard’s fall from grace? Why does Catherine trust a woman who betrayed her own husband and sister-in-law? I saw her as a basically self-motivated character, one far more mature and worldly wise than Catherine, certainly more clever. Catherine comes to trust Lady Rochford, I believe, because she is willing to help her regarding Thomas Culpeper, and a friendship is forged. In her need for a friend, concerns she might have had seem to have been put to rest as being part of someone’s difficult past, which to me is completely believable. Is Rochford sincere in helping the lovers, or is she up to mischief? On page 101, I believe we do see the sincerity of her heart in relation to Catherine. She knows the difference in their level of maturity, and she sees how badly young Catherine needs the protection of an experienced friend. She also desires to make amends for the past regarding Anne Boleyn and feels she is being called to do that in a second chance with Anne’s cousin. Mary Lassells has a more devious plot than first appears when she forces Agnes Howard to bring her to Catherine’s court. What is Mary’s goal, and what is the source of her support? Her goal was rooted in her jealousy from the early years they had spent together, but her cause was religious reform, and that cause was supported by her brother. What is the significance of the poisoning of Catherine’s cat before the wedding? Why don’t Catherine and Henry pursue this poisoning or the motive? That was a foreshadowing for them both of danger ahead and a warning that they were not totally among friends. But at the time, they both were self-absorbed characters who both seemed, in many ways, to live in the moment. That, of course, eventually became Catherine’s undoing. Like Henry’s sixth wife, Katherine Parr, Catherine Howard is repulsed by Henry’s generally deteriorating physical condition. How does she hide her disgust and fool the king? Does Catherine have feelings for Henry? Catherine had little choice but to hide her feelings about that since Henry had total control of her life and her family’s position, and she knew it. That being said, I do believe that she came to love her husband, not romantic love but in her own way, and that she truly cared about his health and his well-being during their marriage. In The Queen's Mistake , Catherine declares: “I am a prisoner of my past and future.” What does she mean? The past was something she has already committed to so she could not change that, and her future had been decided for her. It really was a no-win situation for poor Catherine, I’m afraid, and it was the largest element, I believe, that made her a tragic historical figure, rather than the vapid, selfish one as which she has so often been portrayed. Catherine has her first inkling of Henry’s wrath when Margaret Pole, the Countess of Salisbury, is executed. The executions in West Smithfield near the time of his marriage to Catherine Howard further suggest Henry’s ability to compartmentalize politics and romance. Why does Catherine remain oblivious to the danger she is in? Like many women, I believe that Catherine was still naïve enough to believe that her love and commitment could change him, at least in part. And, in her defense, at this point in her life, before the revelations about Thomas Culpeper, she did have quite a strong influence over him. What did you find most difficult about writing The Queen's Mistake ? The most rewarding? Most definitely it was attempting to tell a story that ends in tragedy without making it a dark and depressing read, especially since most people know how it ends before they start the book. I think that same element was what made it the most rewarding as well, though, in the sense that I tried to show the complexities of Catherine Howard, her life and her relationships, rather than simply repeating the silly, selfish cliché so often portrayed in history. I certainly hope I achieved that. Before reading The Queen's Mistake , I didn’t have much interest in Catherine Howard, the fifth wife of Henry VIII; now I find her a much more compelling character. How would you rank Catherine Howard with Henry’s other wives? I love that question! Ranking in terms of an interesting, complex character, I would have to put her at least second and maybe even tied for first. Catherine of Aragon had such a long and complicated history that she would probably be number one—and she did have Henry’s heart at his youthful pique. But I found Catherine to be so much more than her stereotypical portrayal, and in some ways even noble, that she was great to write about. Many might select Anne Boleyn, but for me there were fewer aspects of her life to make her sympathetic, so I would have to rank her as number three. Are you currently working on another novel? Can you share something about it with us? Sure, thanks for asking. I am almost finished with the story of Bess Blount, the mother of the only natural child whom Henry VIII ever publicly acknowledged, Henry Fitzroy, and the long and complex relationship between the three of them. I hope you will all look for it! Diane Haeger is the author of a number of historical novels. She lives in Newport Beach, California. 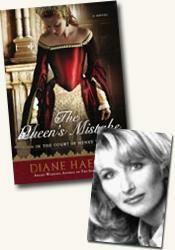 Contributor Luan Gaines interviewed author Diane Haeger, author of The Queen's Mistake (see accompanying review), about her book for curledup.com. Luan Gaines/2009.